• Audio Commentary with Writer Jeri Taylor and Scenic Artists/Trek Historians Mike and Denise Okuda. Unification finds a startling potential defector to the Romulans: Spock (Leonard Nimoy)! The crew of the Enterprise needs to investigate this shocking turn of events. Picard visits Spock’s father Sarek (Mark Lenard) to gain information, but with the ambassador in the advanced stages of dementia, he only gets scraps of material. The Enterprise heads toward Romulus, but they need a cloaked ship to get through the Neutral Zone. They entreat the help of Klingon leader Gowron (Robert O’Reilly) since they assisted him in the recent civil war, but his Klingon pride causes him to deny the Federation request. Captain Picard (Patrick Stewart) shrewdly manipulates him, and soon he and Commander Data (Brent Spiner) hop on board a Klingon craft to go toward Romulus, where they’ll pretend to be Romulans and infiltrate the joint. While Data and Picard try to cope with Klingon “hospitality” and their side of the mission, Commander Will Riker (Jonathan Frakes) takes the Enterprise crew to pursue some mysterious Vulcan material. This leads them to a galactic junkyard, where they find further intrigue. The Enterprise follows the path of some stolen equipment while Picard and Data meet with Spock on Romulus and find further issues there. It turns out the Spock acts toward the goal of reunification of the Vulcans and Romulans, but some forces have other ideas. Somewhere in the back of my head, I knew that Spock showed up during an episode of The Next Generation, but I’d essentially forgotten this before I viewed the two-parter. As such, his presence in “Unification” surprised me pleasantly. This marked only the second appearance of a main member of the original series; DeForest Kelley did a brief cameo in the series’ debut episode. 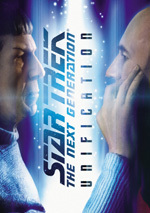 “Unification” offers another connection to the old Enterprise crew as it occasionally refers to events seen in Star Trek VI: The Undiscovered Country. I’m not quite sure “Unification” lives up to the expectations created by Spock’s presence, but it has its moments and seems satisfying as a whole. The Next Generation wisely avoided too many guest shots, and that makes appearances like Spock’s here more effective. How can one not enjoy watching Spock interact with Picard and Data? The latter moments are especially fun since Data always felt like the Next Generation cousin of Spock. “Unification” tosses out some predictable twists and turns at times, but it still manages to provide a good program. 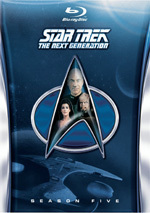 Star Trek: The Next Generation: Unification appears in an aspect ratio of approximately 1.33:1 on this Blu-ray Disc. From start to finish, the episode offered solid visuals. Colors tended toward the earthy spectrum typical of TNG. The Blu-ray handled these tones well and made them effective and clear. Blacks were dark and tight, and low-light shots demonstrated solid delineation. This was a consistently appealing presentation of difficult visual subject matter. I’ve always felt pleased with prior TNG remixes, and the DTS-HD MA 7.1 of “Unification” worked well. The soundscape favored action enough to give it a solid sense of life and environment. Much of the material focused on general ambience, but the track kicked into higher gear when necessary, and that left us with some exciting action sequences. Those delivered well-placed material that moved around the spectrum in a smooth, vivid manner. The disc throws in a few extras. New to the Blu-ray, we get an audio commentary from writer Jeri Taylor and scenic artists/Trek historians Mike and Denise Okuda. All three sit together for this running, screen-specific look at the episode’s origins and development, opposition to the “serial” nature of a two-part program, story/character areas, cast and performances, and other aspects of the participants’ work. I’ve really enjoyed most of the Okuda/writer tracks, and this one comes with a reasonable amount of information. However, it doesn’t match up with the better commentaries, as it tends to meander. Unlike the writers in other discussions, Taylor simply doesn’t have a lot to say about the episode itself, so the piece often veers onto other subjects. Those still work fine – complaints aside, this remains an enjoyable chat – but the overall impact leaves me less involved than usual. A new featurette called From One Generation to the Next lasts 16 minutes, 43 seconds and includes notes from Mike and Denise Okuda, executive producer Rick Berman, freelance writer Marc Cushman and actors Michael Dorn, Gates McFadden, Denise Crosby, and Patrick Stewart. We learn of connections between the Original Series and TNG as well as guest actors, production and costume design, and a few other thoughts. “Next” doesn’t tell us as much about “Unification” as one might expect – and some of the info from the commentary repeats – but it remains a reasonable look at some of the issues behind the episode. One Deleted Scene fills a total of one minute, 43 seconds. Created for the first half of “Unification”, it features a discussion between Picard and Perrin about Sarek’s health, and it would’ve preceded our first glimpse of Perrin in Picard’s office. It throws in a few fairly unnecessary details, so it doesn’t go missed in the final cut. Also, Joanna Miles was simply terrible as Perrin, so the less of her, the better. Disc One opens with ads for ST:TNG “Redemption” and “Best of Both Worlds” as well as Seasons Four and Five. We also find episodic promos for both parts of “Unification”. As a two-part episode, Unification entertains. I couldn’t call it the best of Next Generation but it stands as a fun, involving experience. The Blu-ray provides very good picture and audio as well as some decent bonus materials. 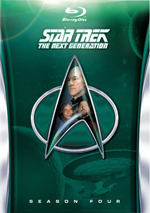 I can’t endorse this disc for fans who already own Season Five of TNG - they’re paying for little more than the supplements – but if you don’t care to buy that package, this becomes an appealing release.